Life of a mad typer: A birthday for the Blog and me! 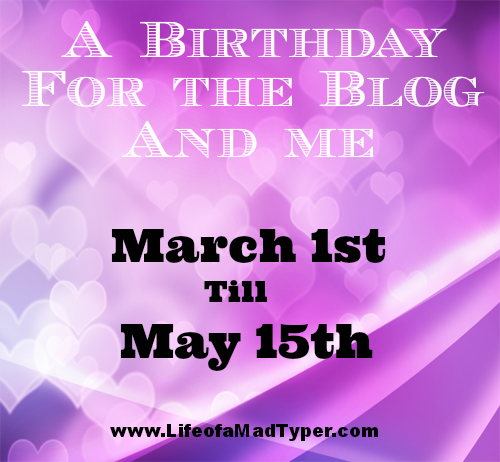 A birthday for the Blog and me! Hey all! I am so proud to announce that this month marks our 2 year blogiversary and my birthday follows it on April 18th so I had an idea to run an event to celebrate both birthdays! Here you will find all giveaways and reviews being featured these next 2 months. Think of it like the HUB of awesome. Thank you for sticking with us these 2 years and welcome to all new readers. Shoplet Your place for office supplies! Oh so Naughty nails. Not for the meek and easily disturbed. lovely birthday wishes and special contest for special day..
Wow what lovely birthday wishes contest. t is a good opportunity for you to get all to get all the things at a place and I really hope that you would like these types of amazing rhymes greetings for new year christmas day greetings 2016 thanksgiving funny photo unique thanksgiving recipes It is so funny an amazing to rad these wonderful things. Kids gets so happy to rad the rhyming lines and I assure you that this collection is the best of all of them available in the market. MRx Male Enhancement What is distinctive about the bench press exercise is that it is a chest exercise which places secondary stress on the upper limbs. Consequently it aids muscle mass building programs by enlargement adjoining flesh. You need to nonetheless also work your triceps and biceps independently . Specifically perform the bicep barbell curl as well as the triceps pulley press on the ground. Magnumax Comprehend is this accomplished I will tell you properly at this moment. it is no outdoor picnic. Its made possible with a very complex and dedicated diet. Suggestions the basic concept. A good bodybuilding workout routine should have this included but make sure that you know should you not. Big compound movements pertaining to example squats deadlifts rows and bench an individual to gain muscle fast. Chantel st claire So use natural skin care merchandise however be open to artificial ones too you may need them when a natural answer is not availableA herbal botanical natural flowers extracts and critical minerals sell mobile regeneration and affords anti oxidant calls natural pores and skin care.